No one has yet been accused of a crime in the foreign exchange market, but there is a lot of talk of disturbing practices, including dealing in personal accounts against clients’ interests. This could be a scandal as big as the fixing of interbank lending rates. However, the probes seem unlikely to address the hardest questions about how the whole currency business works. First, why is this business so huge? By the latest count of the Bank for International Settlements, currency transactions total $5.3 trillion a day. That’s close to 100 times more than the actual volume of exports involving changes of currency, according to the World Trade Organisation. Trade is not the only solid economic reason to use the FX market. But even assuming tourism, capital investments and truly helpful flows in financial portfolios increase the genuine need for foreign currency, the daily volume would be less than $200 billion a day. That leaves more than 95 percent of the business to be explained. Second, why are FX markets so volatile? The value of one currency in terms of another should be set by factors that change slowly: patterns of trade and investment, differences in current and expected real interest rates and relative economic prospects. The typical changes in these indicators can justify annual exchange rate moves of no more than 5 percent, but actual movements are often much larger. Finally, why are currency hedges so popular? They account for more than half of FX trading by non-financial institutions. Defenders say these transactions are a helpful currency insurance policy, offering a few months’ protection from the FX market’s unnecessary volatility. But for large companies and investors, currency self-insurance is much more sensible. Shareholders, who dislike currency gains and losses, should wise up. Over time, it is cheaper to accept the losses and gains than to pay the counterparty’s salaries and profits to do the same thing. A business that is oversized, overly volatile and under-endowed with economic value invites poor practices. Even if prosecutors cannot find illegal activity, the foreign exchange edifice itself has some of the hallmarks of an economic crime. A pedestrian is reflected in the display of a foreign exchange office in central Sydney May 10, 2010. 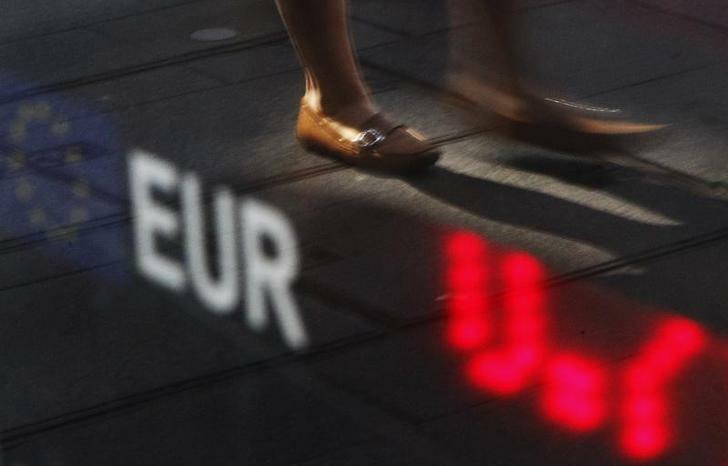 The euro was struggling to hold early gains on Monday having initially rallied on reports EU ministers were discussing a 600 billion euro plan to prevent Greece's debt crisis spreading to other countries. The Financial Stability Board, the world’s top financial regulator, announced on Feb. 14 that it would review foreign exchange benchmarks. This is the latest step in a global investigation into allegations that a handful of senior traders exchanged market-sensitive information and colluded to manipulate benchmark currency rates. The U.S. Department of Justice and Britain’s Financial Conduct Authority (FCA) are among those leading the investigations into potential wrongdoing in the $5.3 trillion-a-day market. The U.S. Federal Reserve is also involved in the probe, several sources with knowledge of the investigation have told Reuters, although the extent of that involvement is unclear.